Learn from a seasoned sculptor how to develop character concepts using clay. If you don’t know what an art toy is, or you have never seen one, there’s probably a good reason. It’s quite a niche industry, but filled with some of the nicest people and most talented artists in the world. About 10 years ago every man and his dog was talking about it; nowadays it’s quite a steady industry, but one that’s growing in popularity every day. Art toys are predominately made by artists who have a desire to see their characters come to life in glorious 3D. In many ways, it’s an extension of their character development. These toys are found at comic conventions worldwide, and are often handmade in low volume runs (as low as 50 or 100 pieces), which can potentially make them much sought-after and valuable. The figures are normally around 8-15 inches, and many artists start small so they can manufacture on a low budget, either by hand resin casting using silicone tools, or in vinyl plastic using rotocast or injection moulding methods (typically done at a factory in China) for larger quantities. This two-part workshop will focus on resin and silicone casting. Before you start making your own resin art toys, you need to understand that there are two main methods of production. The first is the basic method of silicone tooling, which uses just one block of silicone to make simple objects and characters. This method is what we will focus on here, because it’s the preferred casting method for beginners. Split tooling is the more advanced technique, designed to give you greater control over your split lines on each cast while allowing you to produce more complex objects. In the first part of this workshop, I’ll focus on having a solid idea and producing 2D ‘turnarounds’ (see the image above). Once you have these, you can start to experiment in 3D using plasticine, and then gear up to producing a model using Super Sculpey clay. You’ll need some paper, pens, a ruler, a computer and printer, and some Super Sculpey clay and plasticine. I’d also recommended you buy yourself a small set of modelling tools. Before you make anything, though, you need to have a good idea of what you want to make. Your idea can be something new you create just for this project, or something that you’ve been drawing for years and want to see finally brought to life in 3D. Start by sketching out a few ideas and choose a character that isn’t too complicated. Some things just aren’t suitable for resin casting, such as thin forms like hairs or very long spikes. The longer and thinner the shapes, the harder it will ultimately be to get resin into these parts and actually pull the resin cast from the mould. Also, the thinner a design element, the longer it will take the resin to harden. Turnaround drawings are a set of drawings that show six projected views of a character: the front, left side, right side, back side, and if required, the top and bottom too. Ideally, it’s best to draw this up in Illustrator, because you can make adjustments and scale it as you see necessary. You can also use the drawings to see what colour you’d like and how your model will look overall in the final design. The best way to build up another view is to use one drawing to create another. Draw the front first and then use this drawing to build up the other views. Add guidelines taken from the front view (see image above) to help you work out where to draw the essential details; this will help you establish things like where the top of the head finishes, where the arms finish, and so on. Once you have your turnaround drawing, print it out for reference at the correct working scale. To keep it clean, I’d recommend putting a layer of clear sticky tape over it, providing a thin protective layer; you can then work on top of these guides directly while using the clay. It’s a great way of making one guide last a long time, and makes model-making easier and quicker. 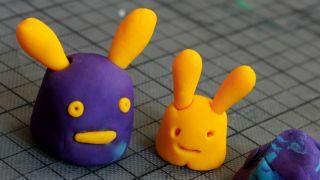 Now build a rough 3D model of your character using plasticine clay. Don’t be precious about how much you use; this is a fun, experimental stage and takes a while to master. Build lots of models and try out different colours. I normally use my whole hand: the palm for rolling soft shapes like balls, the fingers for rolling out sausage shapes, and fingertips for the fine details. I find I do a lot of fingertip patting down to get really smooth shapes like domes and to reduce the visibility of my own fingerprints. If you need a circle shape in the design, try using a pen lid or the cap of a bottle. Look around you to see what other objects make interesting impressions; plasticine clay takes details really well. It’s worth taking a moment at this point to refine your design, and you will probably need to retune your turnaround drawings from what you have learnt using clay. Once you’re comfortable with clay, get out some Super Sculpey. Make sure you knead it well, and have a play to create your model. Super Sculpey can be baked so it goes hard, and you can also sand it and do all sorts of stuff with it. Next issue, we will be using Super Sculpey to make a master, so in the meantime, please read the instructions on the box you bought and get ready to make a master model in part two. If you are interested in furthering your knowledge and fancy getting down and dirty with this fun process, check out the Plastik Surgery website and buy a copy of the Plastik Surgery Handbook to get making. In the second part of this workshop I will reveal how to finish creating your resin art toy. This article was originally published in Computer Arts magazine issue 262. Buy it here.